The World's Finest - Teen Titans Go! Get ready to superheroes in a new way as Teen Titans Go!, a quarter-hour comedy-action series inspired by Warner Bros. Animation�s original fan-favorite series Teen Titans, shows the humorous side of being a teenage hero. Teen Titans Go!, which features the return of Robin, Starfire, Raven, Beast Boy and Cyborg in comedic, high-concept adventures, debuted on Cartoon Network in 2013. Check out the original press details below! THIS SPRING IN TEEN TITANS GO! DC Nation, Cartoon Network�s home for action-packed animated series and original shorts based on characters from DC Comics, will soon be joined Spring 2013 by a new generation of superheroes as Teen Titans Go!, a brand-new half-hour comedy-action series inspired by Warner Bros. Animation�s original fan-favorite series Teen Titans, shows the humorous side of being a teenage hero. The character-driven comedy series focuses on the funny that happens in between saving the world and living together as teenagers without adult supervision. The comedic mayhem of the animated series is punctuated by pranks and the occasional need to fight crime, but it will also deal with the everyday issues of adolescence. With epic staring contests to decide who does the laundry, a series of quests and battles to construct the perfect sandwich or fighting crime in Jump City , one thing is for sure, these Titans will always be ready for an adventure inside the house and out. 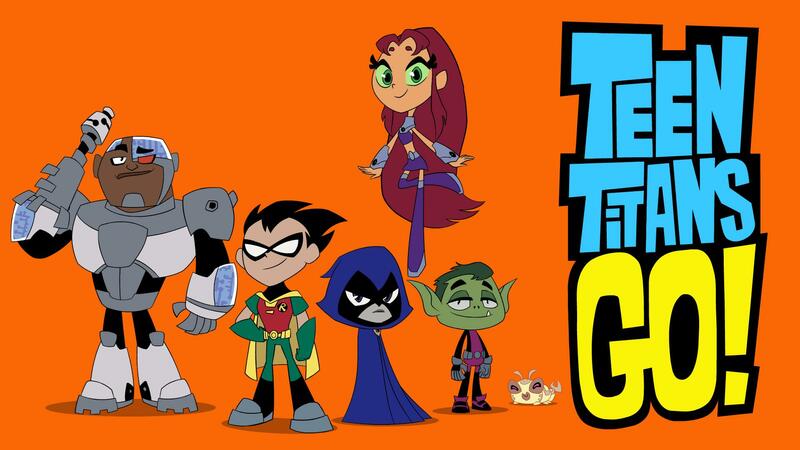 The principal voice cast from the original Teen Titans series, based on DC Comics characters, will reprise their roles in Teen Titans Go!, with Scott Menville as the voice of Robin, the slightly power-mad perfectionist and leader of the Teen Titans. Hynden Walch voices Starfire, an alien struggling to fit in; Tara Strong voices Raven, the sardonic, deadpan demon girl; Greg Cipes returns as the slightly dim but always loveable loafer, Beast Boy; and Khary Payton provides the voice of Cyborg, a laidback kid who is half teen, half robot. The fan-favorite theme song from the original Teen Titans will also be making its return to television, with an updated remix from Mix Master Mike of the Beastie Boys. Executive produced by Sam Register (Green Lantern: The Animated Series, The Looney Tunes Show, Teen Titans), with Michael Jelenic (ThunderCats, Batman: The Brave and the Bold) and Aaron Horvath (MAD, El Tigre) as producers, this side-splitting series will premiere on Cartoon Network in 2013 as part of the DC Nation programming block. Check out one last video below and keep checking The DC Animation Forum for further news and updates on this comedic animated series! Additionally, check out archived news updates for Teen Titans Go! right here on The World's Finest!